HFG: Though you’ve been in California since the early 1990s, your early roots were in the Midwest and Northeast. How have those vastly different perspectives helped you during your career? DP: I think having the perspective of both rain-fed and irrigated systems has been of real benefit. The cropping systems are quite different, as well as the size of farms and the crops grown, but the fundamentals of agriculture remain a constant. I have tremendous admiration for farmers who contend with so many challenges, whether in the frozen tundra of the Upper Midwest or in the searing deserts of Southern California. HFG: The University of California’s (UC) extension system has a long-held reputation of being one of the best in the nation. Do you feel good about its future moving forward? Any concerns? DP: I feel both positive and worried about it. With a team concept, we are able to make genuine progress with a scientific approach to agriculture and form partnerships with industry and the farming community. However, this state is both the largest agriculture state and the largest urban state with nearly 40 million people. The politics are clearly urban, and the UC system in the Agriculture and Natural Resource area has leaned toward trying to satisfy that demand. The concern is that urban dwellers will fail to have a deeper understanding of what it actually takes to bring food to the table for both the farmer and the scientific infrastructure that supports the producer. Will the politics (and tax money) continue to support the partnership between the university and the farming community? We’ve had severe budget cuts in the past and, given a downturn, could happen again. HFG: California is a leader in alfalfa production, but the acres of alfalfa in the state are declining at an alarming rate and now are at the lowest point they’ve been since USDA began keeping records in 1919. Why is this occurring? DP: This is due to several factors, both short-term and long-term. The first is the dramatic rise in “permanent crops” such as almonds, pistachios, walnuts, and grapes. Last year, almonds alone exceeded 1.1 million acres; 15 years ago they were half of that number. That’s a permanent change, driven by microeconomics and labor issues. It has clearly been more profitable during the past 15 years to plant almonds on good ground. However, since these crops are very dependent upon exports, we’ll see whether this is sustainable. Another factor for alfalfa acreage decline is water uncertainty; it was hard to commit to a four-year alfalfa crop during the drought. The groundwater sustainability act in 2014 will force growers to make hard decisions on what they can or cannot irrigate. The recent economic downturn in the dairy industry has also hurt alfalfa production. On the positive side, foreign exports of alfalfa are up, and those producers still growing alfalfa should see a boost in demand for their hay due to the low acreage. This year, we’ve seen hay prices strengthen. HFG: During the extended California drought, alfalfa took a major public relations hit as an inefficient user of water resources. You were instrumental in offering some counter arguments. Do you feel your efforts were successful in persuading decision makers and the public? DP: I think we’ve had at least some impact on decision makers. We’ve met with the sustainability officers of some of the major California companies (for example, Disney and Apple) about alfalfa, rice, and other “water wasting” crops that produce a lot of food but are relatively large water users. The alternative perspective of efficient food production and environmental benefits has helped improve the critique and trajectory somewhat, but we have a ways to go. Ironically, the ascendancy of the almond industry has put the almond growers squarely on the “hot seat,” making alfalfa second fiddle in the “evil agriculture” category. I think the main message when a region is experiencing drought is to acknowledge that indeed, yes, food production takes a lot of water — much more than most people understand. We measure not in gallons but in acre-feet (326,000 gallons), which is shocking to many. Urban water use in California is a fraction of that used in agriculture. The fundamental concept is that plants use lots of water, and we have to become more efficient in how we manage it, but also can’t eliminate this basic fact. It’s an educational challenge. HFG: What roles will subsurface drip irrigation and new pivot irrigation technologies play in California’s alfalfa future? Do you see adoption occurring fast enough, and will flood irrigation remain a viable alternative? DP: I think these will be quite important. The introduction of better-designed systems, including advanced sprinklers, drip, and even better flood systems, will greatly help with application efficiency, conservation of water, and, importantly, yield. However, those systems don’t change the fundamentals of plant growth and water demand as mentioned above. We sometimes use more water in a well-designed system, but water productivity (tons or product per acre inch) goes up. That’s a more important metric . . . more crop per drop. All three types of systems hold promise for irrigated regions, but there is no single, magic solution. Each has its advantages and disadvantages. Flood irrigation remains a viable option in many areas, but can be improved with better designs. Drip irrigation can definitely improve irrigation efficiency if well managed and maintained. Overhead sprinklers and subsurface drip are very useful for alfalfa since one can apply smaller amounts in between harvests (unlike flood). However, many sprinkler systems have evaporation issues, and drip has gopher-damage issues . . . nothing is perfect. We need to improve irrigation efficiencies, water use efficiency, and distribution uniformity for forage crops. We have a long way to go. HFG: You’ve been a strong proponent of changing the USDA hay market grades to better reflect animal response. What would be your criteria if you were the architect of a new system, and how can the industry instigate a change, or can it? DP: The marketing system for forages has always been fraught with difficulty. I think this is due to two big factors, both genuine: 1) A high level of innate variability in hay crops, and 2) The complexity of forage feeding value, since hays provide a combination of energy, high intake, protein, minerals, and the functional properties of fiber itself. That’s why fiber content alone, which is the basis of the relative feed value (RFV) and total digestible nutrients (TDN) systems, is inadequate as a stand-alone marketing tool. equations often being of use for simplification purposes. Digestibility, in particular, needs to be included in our evaluation of quality. But let’s not forget the analyses behind these. We understand that as markets and feeding habits change, the value of each of these components is likely to change as well. The future of testing and marketing has to be nimble and flexible enough to adjust to changes, accommodate different livestock classes, and reflect the complex values of energy, protein, intake, and the functional value of forage fiber. This is the problem with simplified indexes: “Feeding value” remains a complex concept. 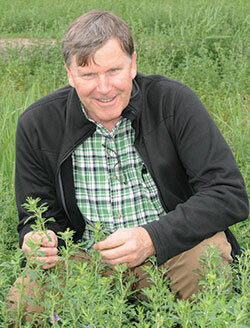 HFG: Western alfalfa production has been buoyed by a strong export market. Will that trend continue? DP: Absolutely. While there may be ups and downs, it’s here to stay. Ask an Iowa farmer whether our cropping systems are dependent upon international markets for soybean or pork, especially this year of pending trade wars. Hay is now no exception, but forages are Johnny-come-latelies to international trade. The equations of land and water availability and food production are really an international question, as witnessed by the recent curtailment of Saudi Arabia’s alfalfa production due to limited water. This instantly created a large import demand from the United States. Western states have competitive advantages in weather patterns, expertise, and infrastructure, which enable high-quality hay production. This is unlike eastern Asia with summer rainfall threats to dry hay. With the expansion of demand for milk products in China and their limitations for hay production in several regions, Asian and Middle Eastern buyers will have interest in U.S. hay for many years to come. Export hay is still less than 5 percent of total U.S. production but over 15 percent of the Western states’ hay market. HFG: Many California alfalfa growers who produce for the export market are unable to use genetically modified (GMO) varieties such as Roundup Ready or HarvXtra. Has coexistence with growers who do use these technologies been an issue, or do challenges still exist? DP: I think challenges still exist, but mostly on the seed side. I’ve seen hay growers successfully produce non-GMO hay for export or organic hay very close to GMO hayfields. However, others who have planted conventional varieties may produce hay with a low level of an unwanted gene. The key issue for hay growers is to demand that the seed they plant be tested for “nondetect” to the level of comfort for their particular market. For exports, this is essentially a PCR (polymerase chain reaction) standard, a pretty low tolerance at less than about 0.1 percent! Any detection is a problem for the exporters and could be refused at port, so most exporters test. There have been exports of Roundup Ready alfalfa to countries that accept it. For sensitive markets, a few other steps are needed such as keeping balers clean between fields and making sure there isn’t excess plant flowering. Some further industry discussions with foreign buyers to develop tolerances and protocols would be helpful to work out practical solutions. Of course, at some level, this issue may devolve into good-old trade disputes over price. HFG: The dairy industry has been struggling in California with low milk prices and intense regulatory oversight. Dairy producers are feeding record-low amounts of alfalfa hay. Do you see this situation getting better or at least stabilizing in the near future? DP: There is a lot of negative talk about the current and future prospects of dairying in this state. The price situation for dairies is miserable with high costs and low profitability. Environmental and labor regulations are also part of the problem, but fundamentally I think it’s mostly a supply and demand issue, both here and across the United States. Although California has the largest market for milk of any state, per capita consumption continues to go down in this state, and we produce more than the state requires. We have become more dependent upon world markets for the demand side. The dairy industry has periodically struggled for many years with oversupply. Part of the problem is the high level of dairy farm efficiency productivity per cow. Unless markets grow at the same rate or cow numbers are reduced, the problem will continue. Dairy farmers have been amazing in what they have been able to accomplish, but they do tend to expel ammunition into their own phalanges. I don’t have the answers, but suspect that California milk production will continue to moderate after more than three decades of relentless expansion. HFG: You are to be commended on putting together a top-notch alfalfa educational conference each year. Can you give readers a heads up on when and where the California Alfalfa & Forage Symposium will be in 2018? DP: It will be held in Reno, Nev., November 27 to 29. See http://alfalfa.ucdavis.edu/ for details. DP: I like Italian, Mexican, Indian, Thai, American, ice cream (alfalfa is ice cream in the making). I think my problem is that I like too many foods! This article appeared in the April/May 2018 issue of Hay & Forage Grower on pages 28 and 29.